I'm not going to say anything new or anything you probably haven't already heard about the latest from Steven Spielberg, but hopefully it will still be somewhat insightful and interesting to you, the reader. 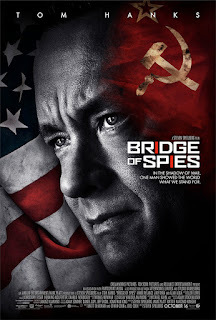 Come to think of it, that's kind of what Spielberg himself has done with Bridge of Spies. There is nothing new or original about what he's put on display here, but it is still very much an engaging and insightful take on the topic he's decided to tackle. 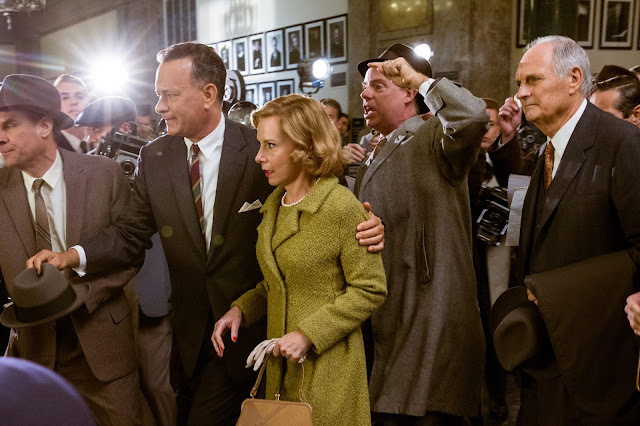 Everything about the film, from it's period setting of 1957 during the height of the Cold War to the fact it once again pairs the most famous director in the world with the most likable actor in the world, Tom Hanks, screams pedigree and pure Oscar bait. What's reassuring is that Bridge of Spies never comes off as such. It aspires to be little more than an intense study of the small details of human interaction and what crafts us to be the people we truly are as tested by extraordinary circumstances. This is a film purely for adult viewers, not because it contains anything too risque for younger viewers sans a few curse words, but because it is a film that moves slowly, builds it's character and tension assuredly and then delivers an overall message that comes at the story from a very distinct perspective only making us consider the many other perspectives one could see this story from (which is sorta the point). Bridge of Spies isn't anything to necessarily write home about in that regard, but while you're watching it, as you're sitting there experiencing it, you can do little more than appreciate the obvious care and dedication that has gone into producing this handsomely mounted picture. That it includes a solid performance from Hanks and something of a revelatory showing by character actor Mark Rylance only emphasizes further the type of respect a film such as this deserves; not only because it is indisputably a good movie that consists mainly of adults talking, but respect for it's backers and makers for being willing to create an old school drama during a time when it seems anything in the realm of adult-skewing entertainment is labeled as less than profitable. Accused Russian Spy, Rudolf Abel (Mark Rylance) talks with his lawyer James Donovan (Tom Hanks). As previously stated, it is the height of the Cold War and tensions are high between the U.S. and Soviet Union due both to the fact each possess nuclear weapons and neither are sure how the other plans to utilize them. In the midst of all this there is a man, Rudolf Abel (Rylance), who is suspected of being a Russian spy. The CIA is confident in their arrest of Abel in his small Brooklyn apartment that paints him to be little more than a humble painter. In an effort to portray the country as fairly as possible the government grants Abel the right to a trial. To this effect, insurance lawyer James B. Donovan (Hanks) is recruited by the CIA to represent Mr. Abel. Every man deserves the right to a fair trial and Donovan acknowledges this sentiment, this morally upright thing to do, despite the fact it could potentially put his family, including wife Mary (Amy Ryan) and their three children, in harms way. While the evidence is pretty overwhelming and the outcome is all but guaranteed before they walk into the courthouse Donovan is an upstanding citizen and gives Abel's case his due diligence. As all of this is taking place Spielberg is intermittently building the secondary story that covers the narrative of U-2 spy-plane pilot, Francis G. Powers (Austin Stowell). Powers, after being enlisted in a secret mission to take photographs of Soviet territory at 70,000 feet, was shot down mid-mission by the Soviet Union and taken prisoner. There is also the facet of American economics student Frederic Pryor (Will Rogers) who was ultimately in the wrong place at the wrong time and was taken into custody by East German police making the intense negotiation mission to release and exchange Abel for Powers all the more so. What is most engaging about the film from the standpoint of an admirer of the art form is the way in which Spielberg is able to convey information beyond the spoken word. His visual sense is unmatched. Still utilizing his well-known techniques, but nevertheless remaining effective under the right conditions. There are certain shots, whether it be the close-ups of children's faces as they watch an instructional video on how to protect themselves from an atomic bomb or that of the many camera bulbs littered on the street from paparazzi outside the courthouse, that simply resonate more than any monologue could ever hope to achieve. Spielberg, as he's always done, uses this keen sense of understanding the image to as good effect as we've ever seen. That isn't to say Bridge of Spies is up there with the director's best work, it's certainly something of lesser Spielberg, but it is to say that the legend is still at the top of his game. In being able to tell a story such as this and make it compelling or give it any sense of energy whatsoever it's not only up to the director to capture his actors dialogue in an interesting fashion, but it's vital they truly understand the story so as to construct a film that conveys it in an effective fashion. With Bridge of Spies it is layers. The first hour, for example, is a perfect balance of set-up and propulsion. We watch in on Donovan and Abel as the two come to know one another through short exchanges in an interrogation room. We see their relationship build and form something of a mutual respect for one another thus creating an objective based purely on principle. It is in short fits between these scenes of Hanks and Rylance giving a masters class in juxtaposing performances that Spielberg feeds the audience just enough information about Powers to make those not familiar with the true story curious as to how all of this might come together. Both Powers and Pryor are wrinkles in a bigger picture. Spielberg utilizes these wrinkles to piece together a full narrative, but doesn't focus on the semantics of their individual situations as the key factor to the story being told is the symbolic meaning of Donovan and Abel's friendship. Donovan leads his wife Mary (Amy Ryan) and boss Thomas Watters Jr. (Alan Alda) out of the court room. There is something rather straight-forward about the film as a whole. Nothing about it feels flashy and yet it is gorgeous to look at (Janusz Kaminski once again serves as Spielberg's cinematographer). The minimal score from Thomas Newman (Spielberg's first film without John Williams scoring since The Color Purple and only the second in his forty-plus year career) is utilized only when necessary and the film is all the better for it. This is a movie about what is being said as much as the Cold War was a war of information. The focus remains on the dialogue and the screenplay from Matt Charman with what I assume were polishes if not a flat out collaboration with the Coen brothers, Joel and Ethan, keeps things moving by virtue of it's effortless dialogue conveying what, at times, could be a rather complex plot. Of course, the fact Spielberg and crew have players such as Hanks and Rylance, along with Alan Alda, Jesse Plemons and Eve Hewson (The Knick), doesn't hurt the way in which this expertly crafted dialogue is spoken either. Admitteedly, none of the secondary players are given much to do here as this is more or less Hanks' show when he's not sharing the screen with Rylance. Per usual, the man is a commanding presence and automatically enlists our deepest sympathies and heartfelt wishes that whatever his character hopes to accomplish that he does in fact accomplish it. Hanks is a perfect picture of the American standard, what we strive or hope to be and that's what needed to come through in James Donovan, the bigger reason I imagine Spielberg once again wanted to work with his prior producing partner and frequent collaborator. What Bridge of Spies does best though, what it is most admirable for, is bringing up the idea that we cannot be fools to our own prejudice. It is a statement that has always been true and is still valid today making the films message all the more pointed despite it's historical context. In taking on the dealings of figuring one another out, recognizing that despite another's interests being different than our own and acknowledging that this opposing point of view is only doing their job as much as the protagonist we're rooting for is doing theirs is a theme as strong for it's insight into why the world works the way it does as it is for opening one's eyes to this possibility in other situations. Spielberg hammers this theme home by mirroring many of the scenes he shows us with similar situations under much different circumstances. Whether it be the conversation Donovan is having with a fellow lawyer about an insurance claim at the beginning of the film that can then be applied to the negotiation Donovan eventually finds himself in the middle of or a particularly moving shot where Donovan is on a train in Berlin and sees people running for their lives, hopping over the wall, only to be gunned down with that of kids hopping fences on their way to school back in Brooklyn, Spielberg knows how to make his point. 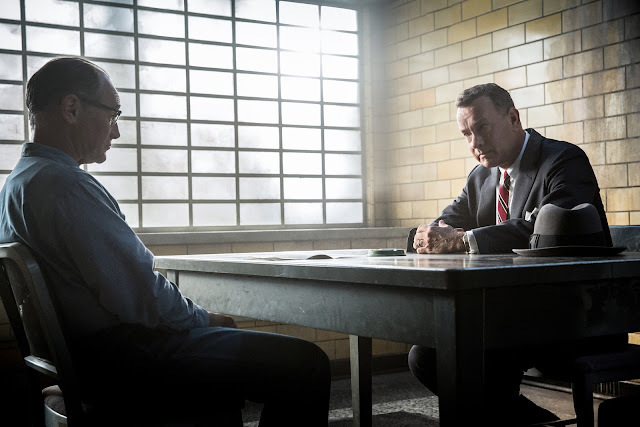 With Bridge of Spies the director says what he wants to say very well and though in the broad scope of things this is meant to be a film about a rescue mission, it more seems to be a statement for modern audiences to take a step back and consider how we might rescue ourselves from those prejudices that are more apparent than ever in this social media age that we allow to blind us in the face of simply treating fellow humans with respect and dignity.